The SCB-India Chapter, to be inaugurated at the Conference, will encourage wildlife study and conservation in India. Memberships will be invited at the Conference. India is a leading country in wildlife conservation in Asia, being a mega-diversity country and harbouring a vast number of globally important sites for biodiversity. India has a growing number of academic programmes in wildlife ecology and conservation biology and can also boast of being a leader as far as laws and policies are concerned. Yet we face a decline in natural ecosystems, ecosystem services and biodiversity during this new century, which can be attributed to unplanned development, demographic pressures and inefficient management of natural resources. Creating a cadre of Indian scientists and professionals who can contribute to wildlife conservation through research, outreach and field implementation is an important task to which conservationists are committed. The Society for Conservation Biology (SCB) is an international professional organization dedicated to promoting the scientific study of the maintenance, loss, and restoration of global biological diversity. The Society’s membership comprises a wide range of people interested in the conservation and study of biological diversity: resource managers, educators, government and private conservation workers, and students make up the more than 5,000 members world-wide. SCB has 80 members in India and over 200 members who are interested in Asian conservation issues from an academic standpoint. Given the far-reaching threats to wildlife, biodiversity and ecosystems in India, including rapid land use change, over-exploitation and pollution, the SCB has offered professional support to the Amity Institute of Forestry & Wildlife to initiate an independent chapter of SCB India. 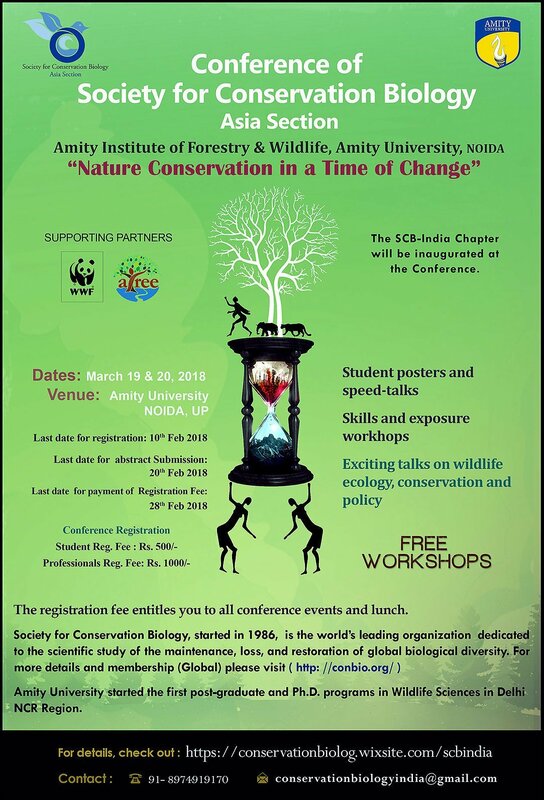 The aim of SCB–India Chapter will be to foster and encourage wildlife study and conservation in India through building capacity, networking and the development of technical and soft skills that are necessary for the modern conservation professional, whether located in academia, government or the non-profit sector. Further SCB — India Chapter will be able to expose students to international professional opportunities for training and placements. Listed on 15 Feb 2018.